The Node's optional Solar Panel Kit (SPNODE) eliminates the need for batteries and provides maintenance-free operation by harnessing the sun’s energy. 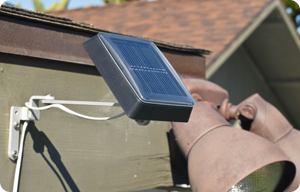 Once connected, the Solar Panel supplies 100% of the controllers’ power, and eliminates the alkaline batteries. This “eco-innovations” alternative is more environmentally friendly and allows for maintenance-free operation of the controller.